Rogue Women Writers: RT Booklover's Convention--Endings and New Beginnings! 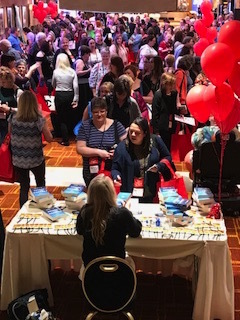 RT Booklover's Convention--Endings and New Beginnings! I first attended Romantic Times years ago, and the experience was absolutely memorable. The people were super friendly, the parties out of this world, and the classes inspiring. I was fortunate to win Bobbi Smith's Writing Contest and I received my trophy from a man wearing a bearskin loincloth. What's not to like??? 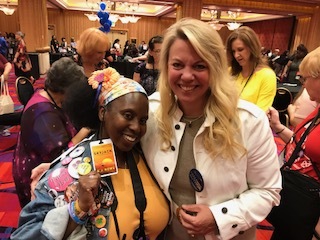 Last week in Reno, I had the pleasure of returning to the final RT conference--and what a week it was. I taught a class on pacing at the Boot Camp. 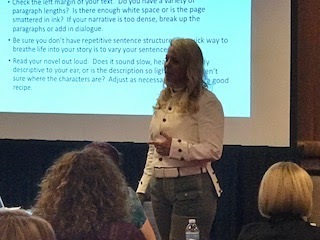 I've attended many writing retreats, learning the craft from some very talented people, including David Morrell, Steve Berry, and Lee Child. I also returned to Seton Hill to pursue a Master's in Popular Fiction. I hope to keep growing as a writer, and it was a real joy to share some of my experiences with an enthusiastic group of students. I loved seeing the fire in their eyes as they absorbed new concepts and ached to apply them to their work. And it sure helped me to share my thoughts, as I'm a big believer that the teacher learns the most from the students. And hats off to Tere Michaels and Damon Suede, as they did a brilliant job with the heavy lifting during the boot camp. Another highlight was the Romantic Suspense party. Talk about enthusiastic fans! Some people lined up for an hour to secure their autographed copies. 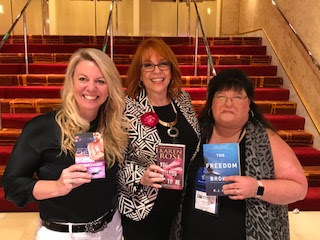 It was an honor to sign books beside Cherry Adair and Karen Rose, two giants in the romance world. The enthusiasm of the readers made this event a highlight. And what a joy to meet people from all over the world, travelling from Australia to South Africa to the U.K. During the convention, Kathryn Falk announced that the RT convention was ending after decades of success. Sad, yes, as it was an institution, a place where book enthusiasts would congregate. But the great news is that Jo Carol Jones, Tere Michaels and the dream team will be kicking off the Booklover's Convention with a few changes. And next year, the conference will be held in New Orleans, a memorable locale that will bring authors and readers out in droves. The amazing fans like this lovely lady who converted my SKYJACK luggage tag into an earring will be there to keep the spirit alive. I hope to see you all there! Kim - You obviously had a fabulous time and did a great teaching job at the RT convention this year. I recall attending that conference for the first time many years ago and I couldn't figure out why there were SO many gorgeous, hunky men hanging around the lobby. Finally, another writer explained, "Those guys all have day jobs as policemen, firemen, electricians...whatever...but they are all vying to pick up contracts to be the models on the cover of romance novels and earn a good salary in the process." Ah yes - I always wondered where publishers found those good-looking guys...now we know. My first (and only) RT conference was also in Reno, years ago. It was a lot of fun. It was also, for a conference, very expensive! Glad to see that someone is continuing with the Booklovers Convention part. So not completely gone. Then again, do you know what sort of changes they envision? SO jealous!! It sounds like such a fabulous conference! Never been to an RT conference, but any conference where there's a man running around in a bearskin loincloth sounds good to me. Wait...should that be ‘hear hear’? I can’t remember.